Are you suffering personal injuries due to the negligence of another person? Has your loved one been seriously harmed or wrongfully killed due to someone's misconduct? If so, you need legal guidance that you can trust on in your time of great need. Most importantly, you need to know what your lawyer brings to the table, and that those qualities are truthful, honest, and earned by a high standard of ethics. You need to know that your lawyer works hard for successful results and positive outcomes for every single client. You need to know that your Schenectady personal injury attorney has extensive trial experience that sets them apart from all the other New York based attorneys that seem to claim the same thing, only to deliver results that are seriously subpar. You need DeLorenzo, Grasso & Dalmata. Attorneys Tom and Paul DeLorenzo have practiced law for residents from New York to Buffalo, and have been serving the legal needs of personal injury victims in the Schenectady and Capital Region areas in New York since 1948. With trial experience in nearly every type of personal injury case, family law cases, and even estate planning, DeLorenzo, Grasso & Dalmata has been listed as one of the Most Experienced Law Firms in the Capital Region Business Review. 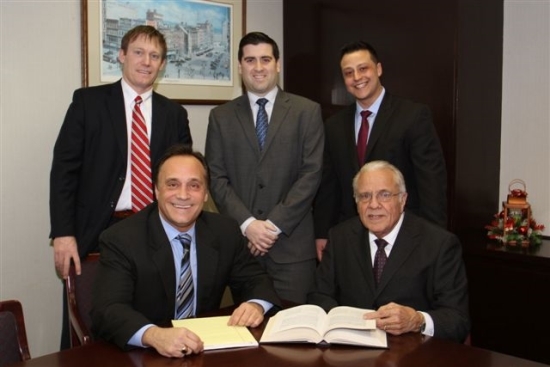 Since opening their practice, the attorneys at DeLorenzo, Grasso & Dalmata has dedicated their legal service to providing active legal representation and going above and beyond the call of duty, which has helped Schenectady injury victims secure millions in verdicts and settlements. Our attorneys have the experience it takes to win! With trial experience in every type of case, you can rest assured that no matter what circumstances may surround your personal injury case, we are prepared and equipped to represent you. Our firm is dedicated to offering outstanding legal service to each client that comes through our doors. We encourage you to learn more about how our attorneys can help you in your time of distress by reading the below attorney profiles! Attorney Tom DeLorenzo was admitted into the New York Bar in 1959, and has shown his tenacity and dedication to clients by supporting his client's cases in their entirety, from beginning to end, and making sure to provide care, professionalism, and intellectual legal guidance through every situation. He specifically chose to focus on personal injury law because he enjoys fighting against big corporations and insurance companies who are trying to take wrongful advantage of victims. In their time of greatest need, clients depend on Mr. DeLorenzo's diligence, and educated overviews of legal processes. Complexity and time is not adversarial to Mr. DeLorenzo, and in fact, he uses those hardships as the catalyst to offering full service legal care to his clients. Attorney Paul E. DeLorenzo was admitted in the New York Bar in 1993, and has spent the last 20 years serving the Schenectady area. Mr. DeLorenzo is the chairman of the Schenectady County Bar Association Litigation Committee, and holds several seminars a year instructing lawyers on how to handle trials. In addition, Mr. DeLorenzo is a regular faculty member of the National Business Institute group, where he routinely instructs area lawyers on updates within the law and trial practice skills. He chose to focus specifically on personal injury because he enjoys fighting for people who need help against corporations and big companies. Mr. DeLorenzo is also a contributor to the new legal publication for New York State lawyers called Strategies for Defending DWI Cases in New York and wrote a chapter titled, "The Fundamentals of DWI Defense in New York State." Currently, Mr. DeLorenzo is leading the lawsuit against New York State for the 57 property owners in Rotterdam Junction. He also earned the Avvo Clients' Choice rating in 2012 for personal injury. Injured? Don't suffer alone. We can help! At DeLorenzo, Grasso & Dalmata, we completely understand how serious personal injury accidents can be. We have experienced the gravity of these situations when aiding victims with their legal procedures every step of the way. As a result, we know that due to the nature of personal injury cases, our clients may need assistance on weekends, or after hours. We are proud to offer around-the-clock availability to our clients, and are happy to help calm their anxieties or stresses with fierce, dependable, and effective legal representation in a wide variety of areas. In addition, our attorneys offer their legal professionalism in other practice areas, including family law, divorce, estate planning, and many more. If you have suffered injuries in any of the above areas, you need a legal team that has experience and knowledge in the specific areas of law if you have any intention of possibly reaching a positive or successful resolution. Our firm has more than 150 years of combined legal experience, and because we take a hands-on approach to each case that comes through our doors, our team of lawyers, paralegals, and legal assistants offers the high-quality legal service, persistence, and compassion that you need in your personal injury claims! When you need legal help after an accident, time is of the essence. You could be facing time restraints imposed by New York, which may put your entitlement to receiving compensation at risk. You don't have a moment to lose, so contact our firm as soon as possible! A Schenectady personal injury lawyer from DeLorenzo, Grasso & Dalmata is happy to help you, so feel free to call our offices or fill out a free case evaluation form to schedule an appointment to speak to a member of our team about your case in person.